2280577 Ontario Inc. (formerly Naylor Renewable Energy Inc.) recently pleaded guilty to three offences and was fined $600,000 for causing or permitting the discharge of sediment-laden stormwater and impairing the quality of the water, failing to notify the Ontario Ministry of the Environment and Climate Change (MOECC) of the discharge, and failing to employ best management practices for stormwater management, sediment and erosion control as required by the ministry approval, contrary to the Ontario Water Resources Act (OWRA) and the Environmental Protection Act (EPA). 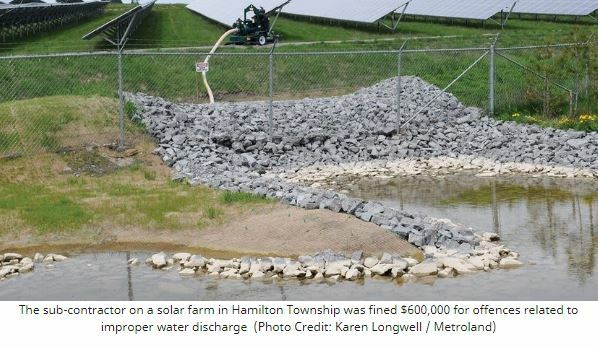 In May 2012, the ministry issued a Renewable Energy Approval (REA) authorizing the construction of a 10 megawatt solar farm known as the Hamilton Solar Facility (HSF) located in Hamilton Township. As a result of contractual arrangements between the REA holder and various companies, 2280577 Ontario Inc. assumed the primary responsibility to implement and monitor the measures as stipulated in the stormwater management, erosion and sediment control plan, as required by the REA. Construction of the HSF site began in 2013 and continued beyond 2014. In late March 2014, ministry staff responded to a complaint by inspecting the HSF site. Ministry staff observed that the erosion and sediment control measures were inadequate. 2280577 Ontario Inc. was advised that stormwater and erosion controls must be enhanced, a sediment control inspection program must be established and implemented, and that any spills or discharges must be reported to the ministry. On April 2, 2014, in response to a further complaint and to determine whether mitigation measures had been successfully implemented, ministry staff conducted another inspection at the HSF site. At that time, ministry staff observed inadequate or improperly maintained erosion and sediment control measures that permitted the discharge of sediment-laden water to nearby streams. Ministry staff observed that snow melt flow was discharging silt-laden water directly into a tributary of Brook Creek and across a farmer’s field to a culvert that connects to the tributary of Baltimore Creek. Further inspections on April 29, 2014 and June 11, 2014 observed turbid, silt-laden water again being discharged from the HSF site into the two tributaries, with water samples indicating that the concentration of suspended solids were greatly elevated at the site and downstream. Based on the information collected during these inspections, a ministry Surface Water Scientist concluded that the discharges of sediment-laden water from the HSF site caused the impairment of the headwaters of both creek tributaries a distance of approximately 2 km in Brook Creek Tributary and approximately 4 km in the Tributary of Baltimore Creek. The ministry investigation determined that the erosion and sediment control measures installed by the company were insufficient or inadequate to prevent the discharges from occurring. It was also determined that the discharge that occurred April 2, 2014 was not reported by 2280577 Ontario Inc. to the ministry’s Spills Action Centre (SAC), as required by the Act. In addition, the investigation concluded that 2280577 Ontario Inc. did not comply with the Construction Plan Report submitted in support of the REA application, and that best management practices for stormwater management, sediment and erosion control were not employed, which contravened the ministry approval. On May 15, 2017, 2280577 Ontario Inc. was convicted of three offences, was fined $600,000 plus a victim fine surcharge of $150,000 and was given 30 days to pay the fine.